Prepare students testing into Reading, Writing, and/or Math at the high school level or higher to enter and succeed in 100 level or above classes. Students who do not test into at least high school level will be offered independent opportunities to remediate and reassess for placement (referred to in this document as Assessment Prep and Soft Landing). 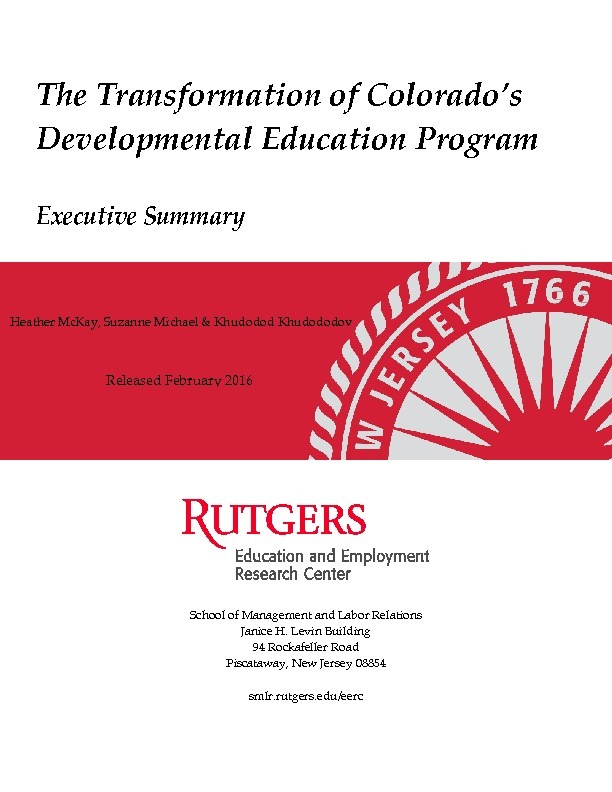 This is the narrative that was submitted to the SBCCOE in February 2013 and adopted as the new way to deliver developmental education in Colorado. The Developmental Education Task Force (DETF) was charged to review developmental education practices throughout the CCCS and make recommendations on what steps the system would take to become the premier purveyor of developmental education in more streamlined and efficient ways, resulting in greater student success. In 2013, we released a publication illustrating our current Developmental Education Redesign strategy. Reviewed and clarified the purpose of developmental education and analyzed implications for policy and practice resulting from a clarified purpose. Reviewed current system policies and practices related to developmental education and proposed revisions to promote greater student success in alignment with sound academic principles and practice. Investigated and analyzed measures of success, data reports and studies on success of developmental education students. Examined structures for developmental education, highlighting innovative and successful strategies, improving the student experience and identifying barriers to success. 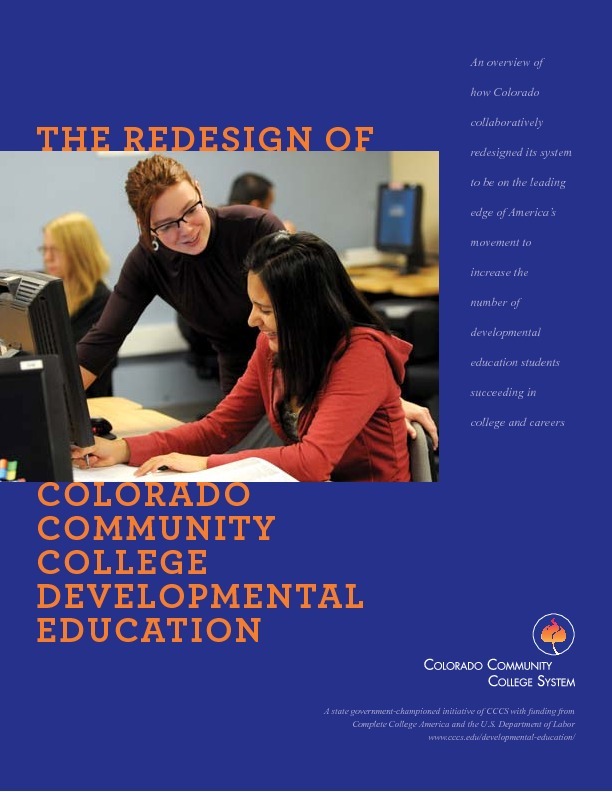 On the basis of a comprehensive review, recommended broad strategies and specific initiatives related to developmental education that Colorado’s Community College System Colleges should pursue, leading to enhanced outcomes for student learning and success. A redesign advisory group will be formed to address the administrative issues and ensure smooth implementation, i.e. BANNER, Business Officers, Advising, Financial Aid. 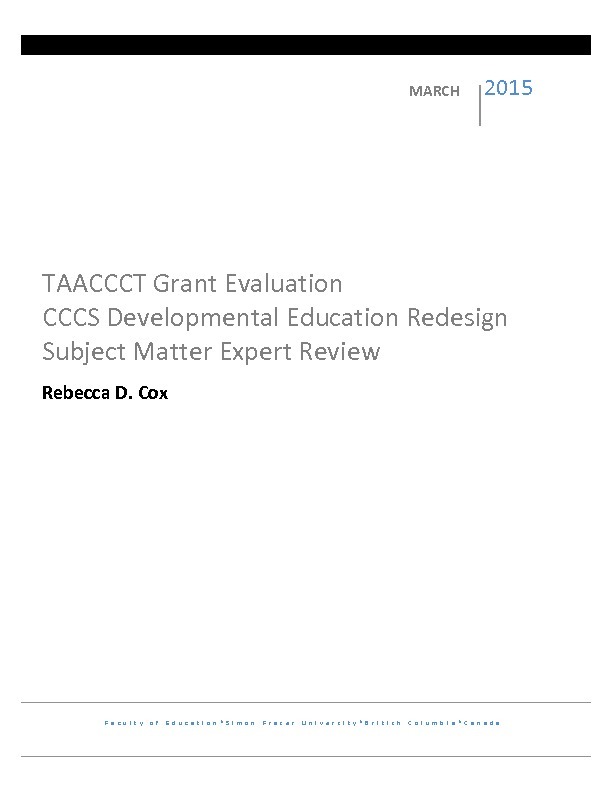 To ensure effective implementation of the DETF recommendations, CCCS should provide a line item budget developed in consultation with individual colleges, the Redesign Implementation Team, and functional groups to accomplish tasks outlined in this document. The State Faculty Curriculum Committee and Educational Services need to ensure an expedited curriculum approval process for the new courses being developed. Additionally, campus curriculum review processes must be expedited to allow colleges to adopt new courses as they become available. 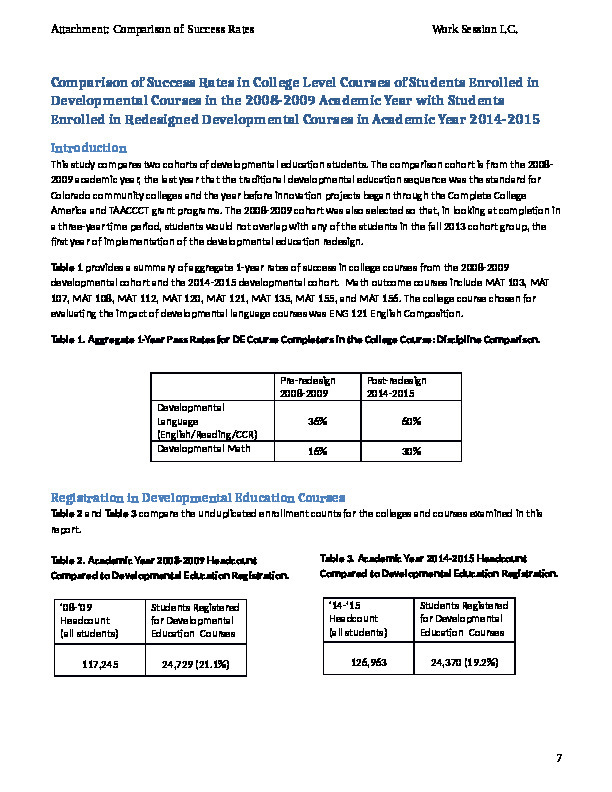 A CCCS specific Assessment will be created using the College Board “strands” and matching test questions to competencies identified in coursework from the new developmental courses. All students should be given uniform, weighted, multiple measures included in their overall placement profile. The measures and weights adopted will come from College Board recommendations. A final placement score will incorporate subject test scores in addition to weighted non-cognitive questions. All placement scores referenced in this document are tentative and will likely need to change once the CCCS Assessment is in place. College Board recommendations will be used during CCCS Assessment implementation. The current plan for this review is as follows: once competencies for new courses are developed, faculty will work to develop the CCCS Assessment in conjunction with College Board. After the CCCS Assessment is given to an entering cohort of students in a fall semester, their placement scores and course success data will be reviewed by a faculty group to determine if the current placement scores are correct. Scores may be temporarily amended until another fall cohort of students use the test and we can collect outcome data (including course grades, and survey data from students and faculty to measure beliefs about appropriateness of placement) on the second cohort. Then, scores will be set based on data available, Fall, Spring, Summer, Fall. Following this roll out, the Assessment and placement scores will be normed every three to five years system wide. The CCCS Assessment scores should be validated every three to five years consistent with test recommendations from the College Board. Assessment calculators should be allowed to appear on the elementary algebra exam and in all other sections recommended by College Board. Each College should develop materials that emphasize the importance of the Assessment and recommend that students be prepared to take the test prior to taking the test. Once GED and ACT develop their new “college ready” standards in 2014, these standards should be incorporated into this document to allow students who have passed alternate college ready measures to place directly into college coursework. Testing Center Directors should form a functional work group –like Financial Aid, Advising, and Registrars. The System IA shall be a part of this team. This testing center team will meet regularly with the System IA to determine processes and procedures that can be standardized across colleges and to stay current with system changes to ensure consistency between institutions. Standardized processes and procedures include, but are not limited to, number of retakes, common non-cognitive questions, and test cost. To support accelerated learning courses, it is important to sustain the non–cognitive and affective dimensions of student learning. CCCS colleges will provide students with access to academic success strategies, college readiness skills, and career counseling. To address barriers to student success, retention, and completion, colleges can use a variety of strategies identified as successful through CCSSE: academic advising, career coaching, case management, orientation, goal setting and academic planning, no late registrations, first year experience, student success courses, tutoring, supplemental instruction, and/or other data informed best practice strategies. Each college will adopt a plan that addresses planning for success, initiating success, and sustaining success for developmental students using these CCSSE strategies. Minimally the college plan should address the three points – planning, initiating, and sustaining success – by using three different strategies; more are encouraged but not required. Each College will develop a plan that engages developmental students from their first contact with the College through the completion of their remedial sequence and their entry into college level work. Colleges will identify how they are helping students plan for success through their assessment and placement, through their orientations, through academic goal setting and planning and/or through the registration process. Colleges will also demonstrate how they initiate success for students by providing accelerated or fast track developmental education, a first year experience, a student success course, and/or learning communities. The Colleges will also describe the intentional strategies they have in place to sustain success such as class attendance, alert and intervention programs, experiential learning beyond the classroom, tutoring, and supplemental instruction. CCCS will fund a system of faculty and staff support to carry out the developmental education redesign. Colleges can choose from a number of strategies to facilitate successful implementation of the new models. Offer limited full time positions to current adjunct instructors during the implementation phase of this work to stabilize our workforce to allow for program adoption to scale on an accelerated pace. Provide release time to current full time faculty and pay to adjunct instructors so they can work with the implementation team to prepare to offer new courses and formats. Offer course release opportunities and reassigned time to faculty and staff to develop and implement student success strategies. Offer other functional work groups on campus–like BANNER, Advising, Testing–time to address the issues of the implementation process. Provide, in partnership with CCCS, continuing professional development for all faculty and staff focusing on research-based student success strategies. Offer transfer level faculty the opportunity to train and understand the same delivery models that will be used in developmental education. Colleges will create a professional development plan to give current faculty the opportunity to improve their skills to meet the requirements of the new courses. Particularly in areas where it might be a preferable delivery strategy to train current developmental and college level faculty to teach the same content, the professional development plan should address how that training will happen on each campus. Math — Successful completion of any college level (100+) math course. College Reading and Composition (English & Reading) — Successful completion of ENG121 or other 100 level discipline strands course. These publications help describe what has occurred with the redesign of developmental education in Colorado.